Since 1998, sound engineer Stéphane Reichart, who specializes in recording and mixing music for films, has made a name for himself in the French audivisual industry, alongside composers such as: Pierre Adenot, Cyrille Aufort, Amine Bouhafa, Klaus Badelt, Yvan Cassar, Alexandre Desplat, Laurent Juillet, Mathieu Lamboley, Christophe La Pinta, David Moreau, Nathaniel Mechaly, Eric Neveux, Philippe Rombi, Thomas Roussel, Frédéric Talgorn, Gabriel Yared. In constant search of new recording techniques, he was the first in France to use the Decca Tree, the legendary symbol of Decca recordings from the 1950s to today. Over the past ten years, Stéphane has worked on more than one hundred films, mainly orchestral projects: Little Nicholas, A Species’ Odyssey, The Beat That My Heart Skipped, Fair Play, Family Hero, Dorothy, In mom’s head, One Swallow Brought Spring, Welcome to the land of Shtis, Trouble at Timpetill. Despite his attachment to orchestra recordings, his adaptability and technical experience have enabled him to collaborate on projects as diverse as acoustic crossover (Charles Aznavour, Roberto Alagna), jazz (Edouard Bineau Dominique Fillon, Vince Mendoza ), vocal (Lara Fabian, James Blunt), variety (Patrick Bruel, Florent Pagny), electro folk (Balmorhea, Bram Vanparys, Tunng), rock (Sonic youth). 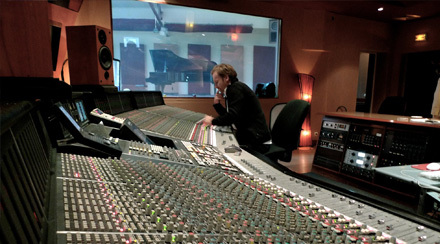 Based in Paris, Stéphane works regularly at Davout and Omega studios, but it is also not uncommon to find him in internationally acclaimed foreign studios such as Air Studios and Abbey Road and Galaxy studios. His subsequent collaborations, notably with Jean Michel Jarre, took him to Egypt, China and more recently in Poland. Committed to education and knowledge transfer, Stéphane has been conducting master classes at the Femis and with Sennheiser France -Neumann Berlin, official partner, for almost 13 years.